We recently received a review copy of Shigeru Ban: Complete Works 1985-2010 from Taschen and I can't say enough how fantastic this book is. The beautiful large format book displays the varied architecture through graceful images, informative diagrams and drawing, while offering insightful text and analysis. Sketches from Shigeru Ban and his staff follow the introduction as it explains his methods and design process. 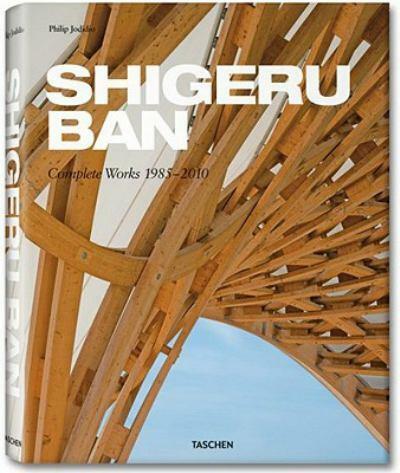 Furthermore, the books highlights the fascinating morphosis of Shigeru Ban's work, as he started out with smaller residences and grew to gain larger commisions culminating in the recently completed Centre Pompidou-Metz - Shigeru Ban's addition to the Pompidou franchise that began with Renzo Piano and Richard Rogers' fascinating building. It also followed his exploration of materiality, particularly the use of paper tubes as structural members. Of particular note is Shigeru's work for humanitarian causes, exploring light weight, transportable shelters for disaster relief areas as well as affordable housing in developing nations. It is refreshing to see such a renowned architect work on projects that aren't just glitzy museums and houses for rich clients. This type of work shows his humanity and humbleness yet highlights his creativity as he designs innovative solutions within extremely tight budgets. All in all, this is a fantastic retrospective of the career of one of today's top architects. I wouldn't be surprised if in a few months Shigeru Ban's name lands as the finalist to the prestigious Pritzker Prize. I would highly recommend this book for any library, as the beautiful images make for an ideal coffee table book while the content acts as inspiration for anyone interested in architecture or design. This fantastic title from Taschen should be at the top of any wish list.